Hoses & Tubes: These are perfect for applications in motors and generators. Plus, these can find useful uses in chemical industries to hold strong fluids without any degradation owing to its advantageous characteristics like resistance to chemicals. Seals: Available in different shapes and sizes, the seals are used to seal the edges in construction and automobiles. The main advantage that makes this product suitable as seals are strength, withstand pressure and allow zero leakage. Automobile Parts: These are used in vehicles as it can withstand extreme temperatures, whether run in a desert regions or in freezing cold regions. Cable & Wire Coating: Yes, the jacket tube on the cables & wires are made using extruded technique. Extruded out of rubber compounds, cable & wire coating protects cables and wires from corrosion, abrasion and the elements. Whatever, your rubber product type need for specific manufacturing application, there are Rubber Extruder to make your manufacturing easy and convenient. The cold feed and hot feed are two major extruder types, used depending upon the temperature of feed. 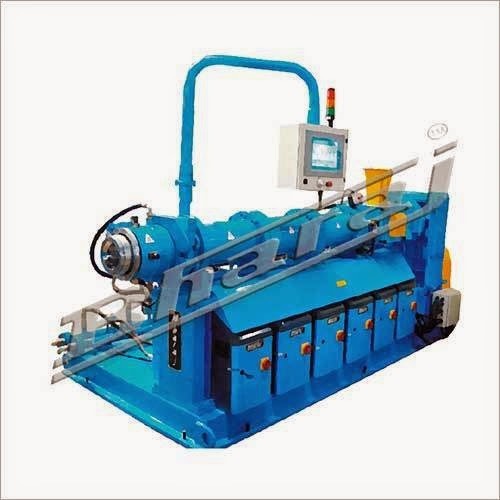 The essential elements for a rubber extruder are a screw, barrel cylinder, liner, bed plate, gear and gear reducer, forward cylinder barrel, feed hopper, feed roll, main motors and controls. The optional accessories include extruder diehead and temperature controller unit. These elements and accessories can vary from one one extruding machine to other; but the basic task remains the same.